In a small bowl, combine the wasabi paste, soy sauce, vinegar, and mayonnaise. Set aside. Brush salmon with olive oil and sprinkle with salt. Lay salmon on an oiled charcoal grill over a solid bed of hot coals or over high heat on a gas grill (450° to 550°; you can hold your hand 5 in. above grill level only 2 to 4 seconds); close lid on gas grill. Grill 6 to 8 minutes depending on thickness, turning over once, until just barely done (cut to test; flesh will be a darker shade of pink in the center). Remove from grill and quickly toast pita rounds on grill, about 2 minutes, turning once. Cut or flake salmon into 1-in. cubes. Cut pita rounds in half and spread wasabi mayonnaise on insides. 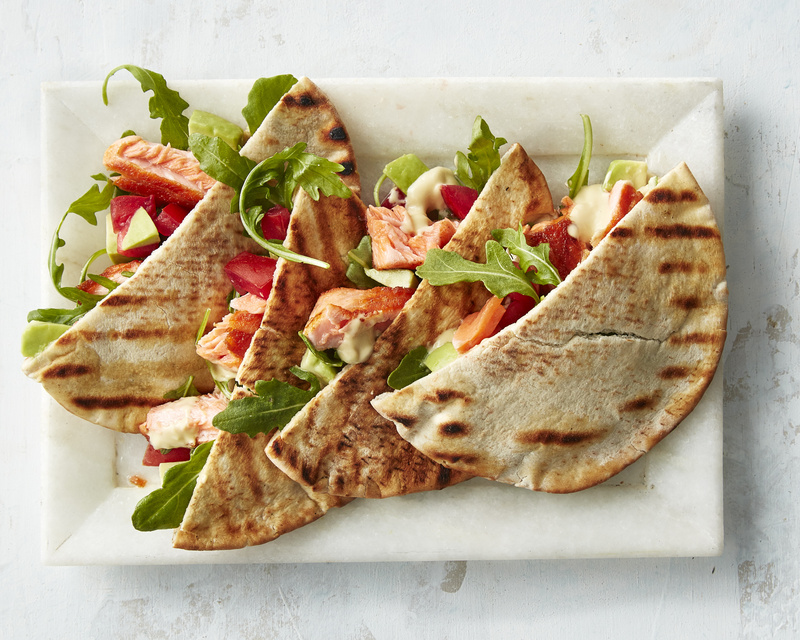 Fill each pita half with salmon, avocado, arugula, and tomatoes, dividing equally.